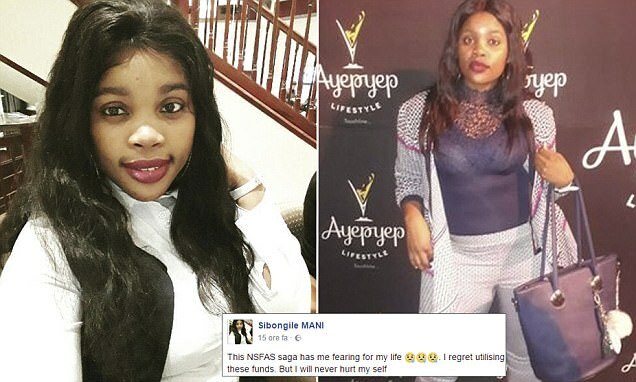 A female South African student who was credited with a large amount of £850,000 instead of her usual £85 monthly university food grant is currently in big trouble after going on a massive 73-day spending spree with her friends. Sibongile Mani, 27, an Accountancy student at the Walter Sisulu University, who's only entitled to only £85 (1,400 Rand) each month for food and book allowances mistakenly received a life changing transformation after the cash error. The university has 30,500 students of whom 18,000 are funded by the NSFAS who are meant to spend their monthly grants on food and books. university called Intellimali mistakenly sent £850,000 (14million Rand) in cash to Mani. Mani stole the school attention when her neat corn-row hairstyle was replaced with £180-a-time Peruvian weaves and she began wearing designer outfits and bought a brand new i-phone 7. The 27-year-old also spoilt her friends by lavishly buying them new outfits, spending £50-a-time bottles of whisky and jetting herself and her pals around the country to wild parties. For three months, from 1 June to 13 August she arguably became the richest full-time student in South Africa. But Mani's problems began when a till receipt from a local SPAR shop was leaked showing that she had more than £800,000 in her account and her wild spending became more lavish and talked about. The accountancy student was finally outed by Samkelo Mqhayi, deputy branch secretary of the South African Students Congress (SASCO), who reported her to the National Students' Financial Aids Scheme. He told Herald Live: 'She threw surprise birthday parties for her friends and showered them with expensive gifts and flew them to events where she bought the best seats. 'When the SPAR receipt was leaked showing a balance of R13.6-million in her account I called NSFAS and they checked their records and confirmed that the initial amount was R14-million'. By the time they reigned her in after her two-and-a-half-month spending spree they discovered she had been blowing £666 a day which is a staggering amount in South Africa. The total missing from the account is £50,000. A fellow student said: 'She went from a hard up, humdrum run-of-the-mill student to one who was leading a lavish lifestyle and seemed to have no bottom to her purse and lived the high life. 'She became very glamorous in beautiful dresses with all the accessories and we thought she must have won the Lottery. 'She must have thought she had won it too when she got that cash,' he said. SASCO branch chairman Zolile Zamisa told Herald Live: 'We are shocked. Not so long ago we were protesting for thousands of students who were left without funding due to fund shortages. In a Facebook post, she wrote: 'Today my personal life has become a social media scandal. I have been named and shamed in public. 'Today, I am a bad person, a person who stole the money of students. 'With that being said, and being named a thief, but as we all know in every story there is truth and there are lies with the very same story'. There also report that she has fled the campus and gone into hiding with her Facebook page, completely shut down. Walter Sisulu University spokeswoman Yonela Tukwayo said the payment did not affect other students but Mani will have to repay the money. 'All students who were due to receive NSFAS payments got them but she will have to repay the money'. Miss Mani could face a charge of theft.